There are million ways to make someone smile. But when it's your brother, you got to be extra thoughtful, especially if he is living cities away. Send Rakhi to Nasik and have him all grinning wide with your surprise. Situated at the foothills of the Western Ghats on the banks of the river Godavari, Nashik is one of the religious places of India. We all know the fact that Raksha Bandhan holds a very crucial place in Hindi calender as this festival celebrates the bond shared between a brother and a sister. The occasion of Raksha Bandhan is also celebrated with a great fervor and happiness. If your loving brother is residing in Nasik and you want to send a very very heart touching Rakhi with different types of other gift hampers, you can easily send it from the online store of FlowerAura. This online store offers a wide range of beautiful Rakhi gifts that include Mauli Rakhi, Zardosi Rakhi, Chandan Rakhi to Kundan Rakhi, cartoon rakhi, bracelet rakhi, beaded rakhi, gemstone rakhi, designer rakhi, pearl rakhi, silver rakhi, gold rakhi, etc. No matter what type of Rakhi you are looking for, you can easily get it available in this online store for sure. 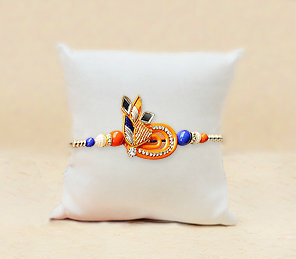 This online store also offers different types of rakhi gifts for married sisters. The people of Nasik are very religious and also celebrate every festival. And Raksha Bandhan, being one of important festivals for the Hindus, is celebrated with immense joy in Nasik. Seeing the enthusiasm and love for Rakshabandhan among people, Floweraura has also taken charge of making this sibling festival more joyful by delivering beautiful rakhi to the people of Nasik.So, if you want to surprise your brother living in Nasik then we have the best idea for you. You can send Rakhi to Nasik to your brother through Floweraura and we assure the delivery of the rakhi to your brother on time. Not just the normal delivery, but through our Express Rakhi Delivery to Nasik, your order will be delivered on the same day of placing the order without any hassle. Raksha Bandhan Is about conveying your sibling love and care to your brother. This festival is to make your bond stronger with him, filled with faith and trust and therefore, through Floweraura be assured that your Raksha Bandhan will be a memorable one. So pick a beautiful rakhi gift for brother on Rakhi and bring a smile on your beloved brother’s face.